GFWC Belmopan Juniorettes at their first organizational meeting. In October, five GFWC clubwomen from two Florida clubs will depart for Belize. 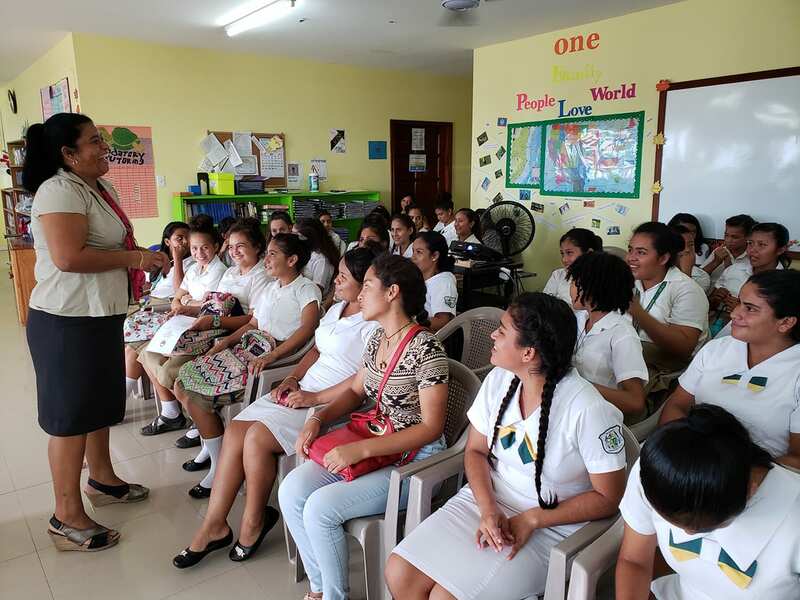 They’ll meet with the newly formed GFWC Belmopan Women’s Club and GFWC Belmopan Juniorettes to share a service project and get to know each other. The clubs are planning a team trivia contest to include questions about GFWC, Belize, and the U.S. The Florida clubwomen will install officers for both clubs and present the new clubwomen with GFWC pins and badges. The trip will be a great chance for all the clubs to work together and bring community change. We love seeing international friendships forged through GFWC! We’re sad to announce the passing of Carolyn Blaue, 1986-1988 Iowa State President and 1994-1996 Mississippi Valley Region President. You can share your condolences with her family. 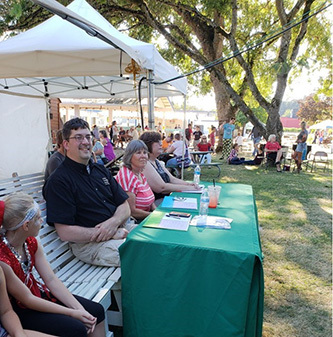 Volunteers in Action success stories are now featured weekly on GFWC’s Blog. This week, the GFWC South Baldwin Woman’s Club (Alabama) and the GFWC Women’s Club of Mountain Top (Pennsylvania) are featured on this week’s Volunteers in Action blog post. GFWC Announces New Staff Member! Join us in welcoming Emily West to GFWC as the Membership Coordinator in the Membership and Programs Department. Some of her responsibilities will include processing pin and certificate requests and GFWC member grants, and working with GFWC’s database. Emily graduated with a degree in American Studies from University of North Carolina at Chapel Hill and hails from Asheville, NC. As part of the GFWC Signature Program: Domestic Violence Awareness and Prevention, GFWC offers scholarships to survivors seeking higher education. When the application opens Monday, promote it in your community! Experience a trip of lifetime and join the GFWC Juniors with your family and friends in Punta Cana from February 2-6, 2019. Learn more. GFWC Centennial Woman’s Club of Tullahoma with their collection of 216 pairs of shoes for Soles4Souls. When GFWC Tennessee President Beth Smith started improving her health, it gave her more energy for activities, family, and volunteer work. The journey inspired her State Project, with the goal of motivating Tennessee clubwomen to work together and improve their physical and mental health through health-focused programs! 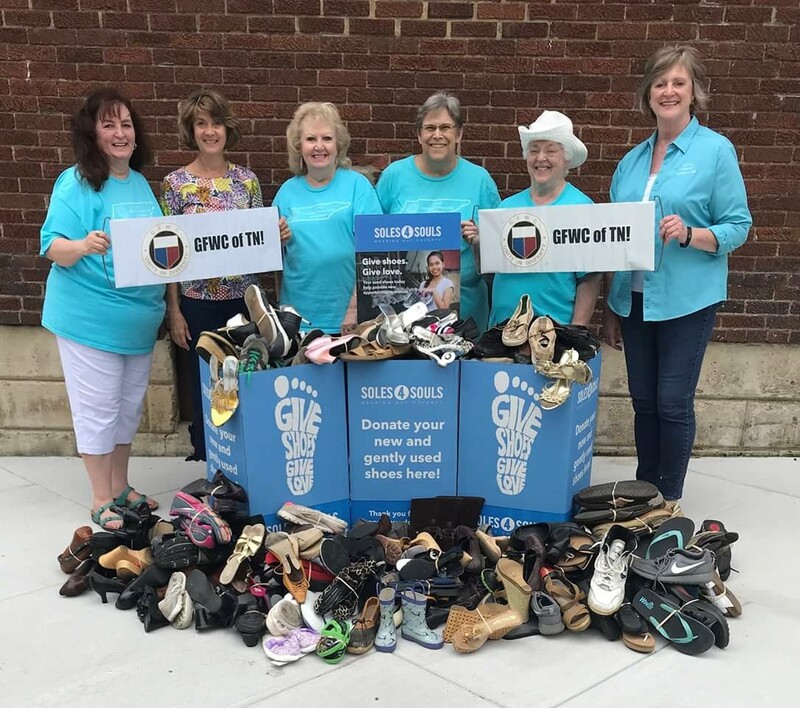 The Soles4Souls Grand Initiative inspired GFWC Tennessee’s goal of collecting 1,241 pairs of shoes, one for every GFWC Tennessee member, by the end of 2018. They’ve already beaten it! The state also has plans for health-focused conferences, including a walk led by a park ranger through a state park to raise money for St. Jude, as well as a community-wide 5K walk/run to raise money for local volunteer fire departments. Members will also walk, run, or bike for the “Charity Miles Challenge.” The grand prize is Beth visiting their club to dye her hair hot pink! GFWC Tennessee is staying active so they can keep taking action! See GFWC’s Pinterest for additional photos. Through November 12, 2018, race alongside fellow Shot@Life Champions and take advocacy and fundraising actions in support of global childhood immunization programs. Together we can make sure our members of Congress know their constituents support global vaccination efforts and understand the vital role the U.S. plays in making a difference in the lives of children around the world. Now is one of the most important times of the year to use your voice, and no action is too small to contribute! There are a variety of ways your club can help – whether that’s holding a 50/50 raffle at your next meeting or taking a few minutes to call your Congressional offices! Learn more about Race to Erase and how you can get involved by visiting shotatlife.org/RacetoErase. Learn more about our partnership at shotatlife.org/gfwc. The March of Dimes Prematurity Awareness Month toolkit request form is now LIVE! Sign up through the link to receive an electronic toolkit and an invitation to a national webinar on October 4 from 4-5PM EST to kick off the campaign. Share the link on your social media, website, and newsletters! Thank you for continuing to work to help all moms and babies by supporting GFWC Juniors’ Special Program: Advocates for Children! The Office Depot/Office Max discount is currently available to GFWC members! If your local Office Depot/Office Max cannot scan your membership card, ask the cashier to manually type the SPC number on the card into the machine. If the store does not honor the GFWC discount, please email the store number, city, and state, to Melanie Gisler at mgisler@gfwc.org. Make sure to check out their new Member-Exclusive Keurig® Discount! One of GFWC’s best and biggest weeks of the year, Advocates for Children Week, is coming up on October 21-27! Start planning now to make sure your event or project is a great success and to get all the helping hands you can. Where in the World is GFWC? Where do you take your GFWC volunteer spirit? Snap a picture of this “flat GFWC” with you, post the picture on your Instagram or Facebook, and tag it using #GFWC1820. The GFWC Juniors will be awarding winners for most creative, funniest, and furthest distance. We can’t wait to see where in the world GFWC goes this administration! The GFWC Fuquay-Varina Junior Woman’s Club (North Carolina) worked with a military-based non-profit to host prom for military children with special needs. Use MLK Day to have a dress and tux drive for a future prom you can host! The project was listed in the GFWC Top 10 Projects. 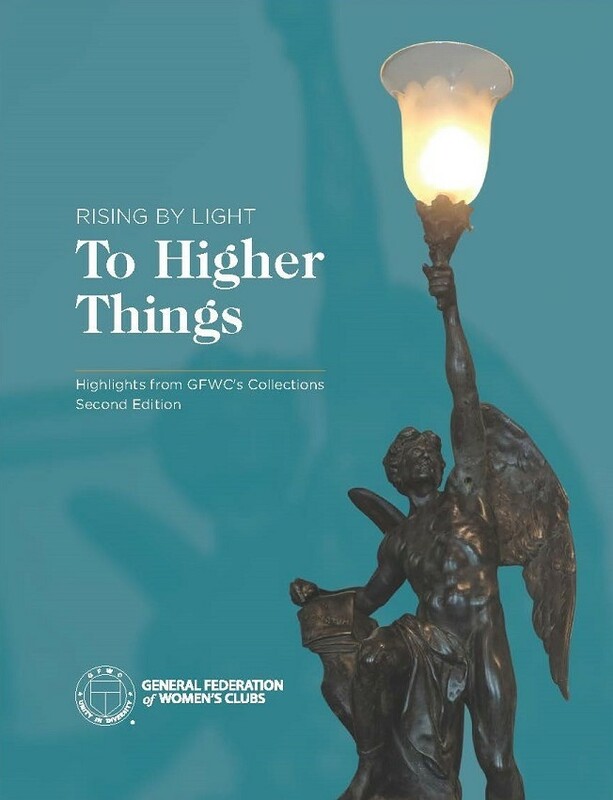 The second edition of Rising by Light to Higher Things is now available through the GFWC Marketplace! 100% of the proceeds from the book are donated to the WHRC and help to support its mission of promoting, preserving, and interpreting the history of GFWC and women volunteers. Your bylaws should state how long a term of office is for each officer. The phrase, “No person shall be eligible to serve more than ____ consecutive terms in the same office” should appear. In filing vacancies for unexpired terms, an officer who’s served more than half a term in office is considered to have served a full term. For example, if the term of office for secretary is two years and Jenny June resigns after ten months, when Jane Doe steps in and serves for one year and two months, she’s not eligible for another term since she’s served for more than half the term. This is unless your bylaws allow the secretary to serve two consecutive terms or if she skips an administration and runs for Secretary in a few years. Unless specified otherwise in your bylaws, terms of office begin as soon as election results have been announced. In many cases, installations are held for new officers, but with or without the installation, the transition to the new officers has begun. If your bylaws state that officers “shall hold office for a term of ________ year/s and until their successor are elected,” then the only way to remove an officer is for cause. This might require a trial, with witnesses, if the officer does not admit to wrongdoing. If your bylaws state that officers “shall hold office for a term of _____ year/s or until their successors are elected,” then the officer may be removed by a 2/3 vote of the membership present at a meeting or by the majority of the members present if previous notice of this possible action was given. The meaning of “and” and “or” may not be clear to all members when written this way in the bylaws, so another way to write this is either, “Officers may be removed from office for cause by disciplinary proceedings as provided in the parliamentary authority,” or, “Officers may be removed from office at the pleasure of the membership as provided in the parliamentary authority.” Hopefully, you’ll never have to do either. Most Federated groups give each officer a term of office of one administration, or two years. Treasurer is often permitted to serve two consecutive terms because it’s a difficult job to learn, and it’s better to have an experienced one when possible. Signing up for News & Notes is easy! Simply provide your name, mailing address, email, and club name to gfwc@gfwc.org!